Software testing is significant to the success of any software product. Efficient testing needs the expertise of talented software testers. Today, with the arrival of software, apps, the demand for experienced software testers has grown rapidly. Software Testing is a highly intellectual work. It also includes aspects of discovery, measurement, persuasion, control, communication, accounting & project management. The most crucial skill that a software tester needs is the ability to find bugs. Apart from the technical skills, software testers require strong analytical and problem-solving skills. Without such skills, they will not succeed in the industry. In this article, we have listed the top 10 software testing skills that all the software testers should have. Let’s have a look at this essential software testing skills in-demand 2018. Analytical thinking is a foundation of software testing. You discover bugs when you apply logic to the testing process. The primary objective of testing is to find the hidden errors, not merely determine that the software works. Having an excellent analytical and logical skills assists in validating applications against various scenario and analyze its elements, workflows against pre-defined standards. If a software tester wants to be effective in his role, he must be capable of analyzing the given business situation and judging all the potential scenarios. He should have the ability to identify and tackle strange problems and should build a strategy to validate it. Building situations and authorizing the application under test, before delivering it to the clients, can be made efficiently only by a person who has excellent analytical skills. The basic knowledge in the context of testing can be associated with the fluid mix of values, experience, expert insight and contextual information. Those things will give a framework for assessing the system under test. A smart tester should be ready to use the knowledge gained across years of experience in the domain, product, customers, process, delusions, and successes in his testing. He should be ready to make use of essential communication, mathematical and software application skills. Besides, he should be prepared to apply the skills he has gained to practical situations effectively. Software tester should be able to visualize real-time business situations through mind mapping, and extracting the idea gathered from the specifications. The real-time business scenarios need to crystallize in a software tester’s mind. Besides, he should be ready to make a complete system simulation rapidly and accurately. In the present software development environments, it is difficult to believe that teams/individuals will get more time to do a series of regular brainstorming sessions to conclude the concept mapping. Every software tester must have excellent communication skills. A tester should be ready to communicate his thoughts and ideas effectively, using different tools and media. By great communication, we intend that they should be a speaker, good writer, reader and listener to efficiently communicate with stakeholders. This powerful skill helps to update the status of the project to the clients, translate requirement documents to test cases, inform about requirements to the team, and prepare reports for management. Hence, having an excellent communication & interpersonal skills assists in confirming a high degree of comprehension which further aids in conveying insights and providing feedback to both technical and non-technical people by logically and intelligently. Learning should be a lifelong habit. The organizations and business environments are changing rapidly, which means the methods and processes that work well today will be outdated tomorrow. Therefore, it is essential that a software tester give priority on investigating, adapting and learning from change and evolution that is happening around him. If he has gained fundamental knowledge, then the rest can be achieved by self-learning. The software systems have become incredibly complicated. Most of the time, the designed system includes various stakeholders, and it’s not easy to deal with such systems. A software tester should be ready to deal efficiently with business situations identified by the complexity and the bunch of interactions with third-party systems. He must be prepared to find how the system under test interacts with other elements of the system. Moreover, he should be capable of separating the most minute units of the application under test and perform the validation. At the same time, a software tester must keep his eyes and ears open so as not to ignore issues that might be integrated with different components. Thus, a “glocal” (global + local) approach is necessary. The thinking process of a software tester should be undistorted, fair and without any assumptions. A tester should be ready to take charge of the internal structures and need intellectual standards on the software under test. He should be able to ask crucial questions precisely, collect and assess relevant information, execute it efficiently to come to well-reasoned solutions. A tester must be open-minded, exclude any judgment in the absence of adequate evidence to support a decision, and always persist by logical reasoning. 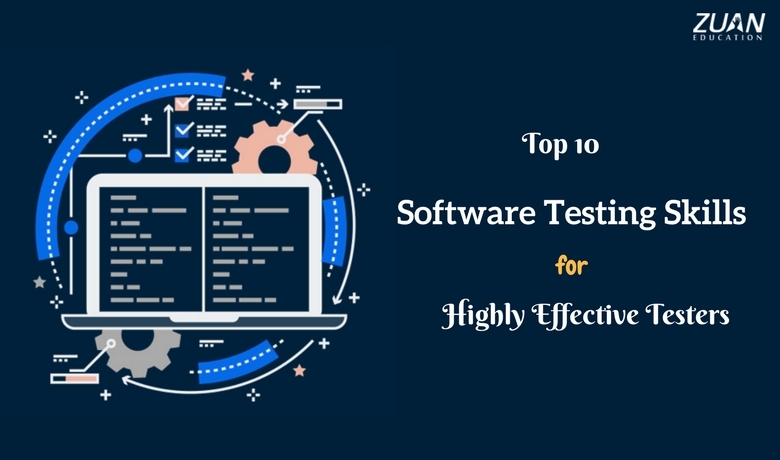 A software tester should be able to analyze the piece of software under test and the resulting processes, with focus on the provided specification, and comprehend the behavior of the software. A tester might have resolved biases, intolerances, prejudices that prevent him from doing well. He needs to own the intellectual integrity to fix those barriers to learning the nature of the software under test efficiently. Moreover, he should be prepared to shrug off the collection of practices, and character attributes that impair his intellectual integrity. Software testing is not a conventional or mundane task. Preferably, it is a process that needs creativity and intellectual bend of mind. Creativity and intellectuality cannot be learned yet; one can try to think out-of-the-box by investigating the application behavior and analyze various sides of the application to know it’s working. By applying intelligent insights and solutions, the software testers can investigate many test scenarios, find defect possibilities and explore possible solutions for presenting adequate product quality. Learning the skills of project management will guide problem-solving ability to software testers. Project management skills also prepare testers to be responsible and answerable for their work to concerned stakeholders and also undertake responsibility and management the end-to-end testing project. This way, project management skills provide to delivering quality results, growing the entire testing process. A software tester must stay productive even when the process going is difficult. Enthusiasm to learn and a search for process improvement can assist keep your testing practices in the top frame. Moreover, it is excellent to have the respective IT domain skills and programming knowledge. With programming skills, you can get the opportunities in code level testing. Understanding of code structure will assist you in developing more worthy insights for the development team. Hence, these are the top 10 software testing skills that every software tester should have. The right skill set will assist you to ascend new heights in your software testing career. Be it a self-learning or a professional software testing training program; the software testers should continuously learn new methodologies, approaches, and processes to enhance performance in testing and continue applying the new skills. So, this learning will keep themselves stand out from the competition.